Do Filters Affect the Resolution of Lenses? Home » Photography Tutorials » Do Filters Affect the Resolution of Lenses? Just like the old “film vs digital” or the “Nikon vs Canon” debates, lens filters often create endless discussions on the Internet. Some people argue that one should never use protective filters, since it is another piece of glass in front of the lens that reduces resolution and emphasizes other optical problems such as ghosting / flare, while others argue that filters make it easier to protect the front element of the lens and make it easier to clean that element. I personally have been recommending use of protective filters for years, as long as they are of high quality. The filters that I have been using do not seem to affect the resolving power of lenses they are mounted on and mostly do not seem to heavily affect ghosting / flare either. Having spent the last couple of weeks in a lab testing many lenses, I wondered if I could actually measure the resolution of a lens with and without a filter. I recently purchased a used lens that came with a crappy plastic filter, so I decided to run two separate scenarios – one without a filter, one with a high quality B+W filter (more on B+W products below) and one with a cheap plastic filter. The results of the study came out very interesting! If you look at the above charts, they look pretty much identical. There is a slight variance in numbers, but that’s expected when going from one image to another – Imatest scores can be slightly different even when you do not change anything. Judging from the above case, using a high quality filter does not affect the resolving power of the lens at all. This is a good scientific proof for those that claim that all protective filters decrease resolution. Myth debunked! Now this is an interesting result. Looks like using a cheap filter does indeed affect lens resolution. There is about a 10% drop in resolving power across the frame! And I am sure, if I were to take this lens and shoot it against the sun, this particular filter would surely make ghosts and flares appear worse. This was an interesting study, because it proved that high quality filters have no affect at all on lens resolution. If you keep them clean and in good shape, they also do not affect the ghosting and flare properties of the lens. You might see a little more ghosting/flare on some filters, but if it annoys you, simply dismount the filter and put it back on once you are done shooting against the sun. It is not like you would shoot against bright light every day right? From my experience, the multi-coated B+W filters have no affect on ghosting/flare, so I never bother to dismount filters when shooting against the sun. At the same time, make sure that you are not using cheap, low-quality filters. As you can see from this article, cheap filters do indeed affect the resolution of the lens and they can seriously affect the ghosting and flare properties of the lens. I have seen reduced contrast and really nasty ghosting / flare with cheap filters before, so I have learned my lesson on not buying those. If you are looking for recommendations on what filters to use, I have been a huge fan of B+W filters. All filters that I buy (neutral density, polarizing, clear) are B+W brand. They are made of high quality glass and they are manufactured in Germany – so you can expect the best performance from them. A key feature you should always look for in high quality filters is MRC, which stands for “Multi-resistant coating”. No matter what brand you go with, always make sure that the filter comes with this particular coating. This anti-reflection coating is the key to getting little or no additional ghosting/flare in your photos. The one I usually get for pro-grade lenses is the B+W 77mm UV Haze MRC 010M Filter. At $72, it is not a cheap filter, but it is worth it as you can see from the above test results. I have been using this particular filter for several years now. The last thing you want to do is mount a $10 filter on a lens worth hundreds, if not thousands of dollars! There is a new XS-Pro version of the above filter, which is slightly more expensive at $87 (adds nano coating), but I doubt that it will make a huge difference. I have purchased a couple of those recently and I cannot say that they are better in any way. Note that UV protection is not needed on digital cameras, because sensors have a built-in UV filter. So when you mount a UV filter on a modern DSLR, it simply acts as a clear filter. So either buy a UV or a clear filter – both should be as good. Obviously, you have to choose the right filter size for each lens you own. The above links are for lenses with 77mm threads, so if you need another size, simply type something like “B+W 67mm MRC” in the search box at B&H and you will find a clear filter quickly. You will see that as the size of the filter get smaller, the price of the filter is reduced as well. For example, a 67mm B+W MRC filter costs around $43, which is significantly cheaper than the 77mm filter. If you do not know much about filters, I wrote a detailed article on using lens filters. Give it a read – it is pretty extensive and covers all of the above-mentioned filters. Thanks for the findings. Any experience on Hoya HD filter? Max, I think the new “nano” versions of B+W filters are specifically made not to attract dust. Hoya pro stuff should be very good though – I only heard good things about them. What about the original Nikon filters? Why You avoiding talking about it in all of your articles? Saleh, you are most welcome! I do not remember avoiding talking about Nikon filters – I have just not used them personally to talk about them. They should be pretty good too, but I doubt they are as nice as the B+W brand. It is hard to find info on them – I don’t even know if they are MRC coated or not. If they are not, I would avoid using them. Yes they are (multicoated) and about the same price as B&W – I use Nikon NC 77mm filters on 16-35, 24-120 and 70-200 on D800 – never had a problem. I would think that flare is going to be a problem with or without filter if you are not going to use the supplied hood – that is what they are for! That said the N coating on Nikkors does make a difference in this regard. Fred, flare happens with and without lens hoods – typically it is a result of internal reflection. If you photographed a bright source of light at night, you might see some flare and ghosting as well – and that’s shooting the target directly. I use either B+W UV or Nikon Protect filters on all my lenses. Can’t see any difference. I stopped using protective filters ever since I had a case where I got some flare on a 17-55 f2.8 (in my DX days). It turned out that the flare was caused by the protective filter because it was gone as soon as i removed it. I used a high quality and expensive B+W with MRC coating. Since that day I no longer use these and I honestly don’t see the point for such filters. I take great care in handling my gear and the sun hoods do provide an additional layer of protection (against bumping into things). Is there a UV filter without a color cast, or must there be one due to the Multi Coatings, and / or resistance coatings. I thank you for your advice. I agree with you. I stop using filter since once shot that has horrible ghost in a wedding event. The ghost completely destroyed the absolutely nice photo in which the bride touched and burst into tears. It took me some days to remove the ghost using PS but it is still not perfect. From that time I do not use any filter. I found no difficulty in clean the lenses and I have been using dslr for >10 years and found no problem in the front elements of the lenses without so-called “protective” filter. Therefore, the protective filter does not protect the lenses, does not make the lenses difficult to clean, and it does increase the size, and cost more money. I just do not see any value of the filters, provided that you are experienced in taking care of your lenses. Thank you for sharing your study and bursting the myth about use of filters. Thank you for your feedback! Yes, Bob did a great job with that article and he is a phenomenal infrared photographer. In past I used different filter, on different lens. Now on my 17-35 (tokina) – 28 – 50 – 85 (nikon 1.8g) I use hoya HD and Nikon NC filters. They are booth good filter, little difference in price, but great performance. I compare different situation with no filter -> hoya filter -> nikon filter. I’ve been taking photographs of the moon using my Nikon 70-300 lens for quite a while. I’ve found out that photos of the moon without the UV filter are noticeably sharper (@100%)compared to the ones taken with it. My photos are taken with a sturdy tripod + mirror up mode + remote release so Im pretty sure the quality has nothing to do with camera shake. I use Hoya Multicoated UV filters for my 70-300. Would you consider this filter as a “cheap filter”? It costs around $20. Sid, I think there is a variety of Hoya filters out there, some of them are fake. If the photos turn out to be sharper without a filter, you might have a bad/cheap one. Like I have shown in this article, a good filter should never affect the resolving power of the lens. an interesting subject. i might add it’s not just the filter, but the number of air to glass layers which affect resolving power. you can test this by stacking 2~3 hiqh quality filters in front of your lens. other variables include misalignment, thickness of the glass, temperature, humidity, coatings, and impurities. kodak’s thriftier wratten gels optically performed better than most glass filters, but were consumables affected by handling and humidity. furthermore, they offered little to no protection against the elements. one benefit to nikon filters on nikon glass is they matched the coatings and properties of the glass closely with their lens designs. this could significantly reduce interference patterns caused by atypical lighting — but bears more significance to scientifically controlled photography than general purpose. Over the past 30 years, I have destroyed countless protection filters on the fronts of my lenses, from dropping them or something. It is a lot cheaper to replace a filter than the front element of a lens I use everyday. As Nasim says, if it is a good quality filter, there should be no problem. Remember to keep it clean. I think some people get too absorbed in minute things and miss the big picture. If you get a scratch on the front element of a 70-200 2.8 and have to ship it off to get fixed, that costs a lot of money AND you are not able to use that lens. As a working person, that does not add up. By the way, I really like your website. Keep up the good work, Nasim! Paul Crouse, this doesn’t have so much to do with the use of filters as questioning the logic of: “I have destroyed countless protection filters on the fronts of my lenses, from dropping them or something. It is a lot cheaper to replace a filter than the front element of a lens I use everyday.” Do we know if filter glass is made as strong as lens glass? It could be just that it is glass that does not have the same strength as lens glass and putting a lens in the same situation as the filter glass, the lens might hold up better to breakage. I’m curious, why use a UV filter specifically when a No-Color filter wouldn’t introduce any possible color casts in various environmental situations. I think the choice of a filter as protective is definitely a personal choice. If a lens is insured then it really doesn’t buy you anything. And there is also the issue that the front element is the cheapest to replace and if you banged the lens just right the filter may get stuck to the lens. I’m not against people using filters as protection but to also bring up the other considerations. Good care and insurance is always the best way to start protecting a lens. Neil, UV filters are not needed on digital sensors – they were only relevant in film days. Just ignore the “UV” title, as it does nothing. Just a clear filter, that’s all. B+W sells a variety of filters, some called UV, others called clear. As far as I know, there is no difference between those (I have used both) and I have never seen my filters introduce color casts to photos. And you are absolutely right – using protective filters is definitely a personal choice! I have good experience with using multicoated filters by B+W, Marumi (very thin and light filters from Japan), Hoya and Kenko. I’ve used some CP filters from other manufacturers with success but I think the above 4 manufacturers are pretty safe. David, I have heard good things about the brands you’ve mentioned. Not very knowledgeable about Kenko, but I know they make nice extension tubes and teleconverters. Thanks and an interesting review Nasim. On the basis that UV or Sunlight filters have no effect on digital cameras as the sensors already have filtering capabilities, I use the higher end clear protection filters from the Hoya pro range. I do have some older pro UV/Skylight filters and use them occasionally on my 35mm Nikon film cameras. Richard, you are right – digital sensors already have UV protection. Which is why the title “UV” does not do anything, so you can use those just as well as clear filters. “Skylight” filters usually induce some color casting (pink/brown). Good quality UV and clear (protective) filters do not. Thanks for this! Will share. You’ve confirmed what I’ve felt for years, and have debated with other photogs who don’t use filters. I’ve used Nikon filters for decades and they’re very good, but I generally buy B&W also now. I absolutely will not take a chance and use a $2000 lens “naked” w/o filter … they are cheap insurance, and then I don’t hesitate using my t-shirt to clean the lens :) Did I just say that? Patrick, I fully agree! I often clean filters with my t-shirt myself, LOL. And despite what anyone says, I have no problem with breathing on the lens and then wiping it :) I would probably not do it on the front element directly, but having the filter gives me a piece of mind. Why did you measure the expensive filter at f5.6 and the cheap filter at f2.8? I’d say that pretty much invalidates the results. The expensive filter might show the same drop off at f2.8. The aperture doesn’t matter. Only the difference between using a filter and not. He tested at f2.8 without a filter and 2.8 with cheap filter. Perfectly valid. Robert, not really – I actually measured all apertures on both lenses. Could have given f/5.6 from the 55mm, which pretty much shows the same picture as wide open – sharpness is degraded with a cheap filter. I wish I had a cheap/crappy 77mm filter to do this all on the same lens, but unfortunately I do not. I use a selection of high quality filters, mostly Hoya Pro-1D UV, a B&W 67mm polariser and a Hoya HD 77mm. I have had no problems with any of these quality brands. Peter, thank you for your feedback! If you spend $2K on a lens, why would you buy a $40 filter? Quality matters in your glass, it should also matter on the filter your choose. I have used Hoya, B&W and Kenko and find them all great quality. Lately I have been moved to Singh-Ray and find that the results are incredible. They are expensive however, but worth every penny. My wife swears by her LB Color Combo (warming polarizer) and we have various others including the Hi-Lux, Blue/Gold (fun) and the Vari-NB Duo and GND filters. I would love to have more, but its a gradual move to bankruptcy not a race. Thanks for the testing and debunking of the myth. I have mentioned both sides in my Photography classes I teach at the college level. I have always been purchasing higher quality filters for the expensive lenses. I agree with StevenP–make the investment not just on the lens. Thank you for your feedback Tim! My Hoya UV filters have given me good service but a couple of cheap ND filters used recently gave very bad picture quality SOOC. Will have to see if I can recover some of that in post-processing. Kumar, hard to recover decreased resolution and contrast in images…I hope you’ve learned the lesson! I have done that myself in the past and I will never go back to cheap/crappy filters. Thanks for the greatwebsite and the information on it. IMHO I will not put a filter on any of my lenses unless it for a specific purpose such as a polarizer, ND or a Graduated ND. Why even invite the chance of the loss of contrast, ghosting or flare by putting another glass air interface in front of the sensor or film (unless that is effect you desire). Digital cameras or todays film do not require UV filtration, so that leaves only one reason to put a Neutral Color filter on a lens; “protection of the lens front element”. In most cases I find that a lens hood provides better protection than a filter does except when I shoot motocross (lots of mud) or in an environment unfriendly to my front element, then I will use an NC filter to prevent damage to my lens. Recently I was using a lens with a ND filter on it (24mm PC-E) that I dropped and when the filter broke the glass from it deeply scratched the front element making the lens useless and also the filter ring was dented. That repair set me back a few bucks and if the filter was not on it I doubt that the front element would have sustained such severe damage. I may have been unable to mount filters but I still could have used the lens. Another thing to be careful of is vignetting on wide angle lenses, my 16-35 F4 will vignette at 16mm even with the thinnest of filters mounted on it, so if you have an NC filter on it and you want to add another filter such as a ND and forget to take the NC filter off first you will be cropping to remove the dark corners. So unless you shoot in unfriendly environments with lots of airborne dirt, grit, or something that could ruin your day put that money you would have spent on a NC filter into something useful like a good grad, polarizer, or ND filter which will improve your images and makephotography more interesting than something that really does nothing. Agreed! The biggest issue for me with filters is ghosting and flaring due to additional panes of glass, which this study does not address. Secondly, as a landscape photographer, the testing at f/2.8 and f/5.6 are pretty much meaningless for me. I can shoot through blades of grass at those apertures without affecting the IQ! Think of the amount of sensor dust that appears in an image shot at f/16 versus f/2.8… aka a ton (potentially) versus none at all. Any and all affects will be far more pronounced at smaller apertures, so I’d like to see results for those. Matt, I measured the entire range of apertures using Imatest – I can publish the rest of the result as well, just did not want to overwhelm this article with too many graphs. One thing to keep in mind as far as optics, is that the front element has very little effect on image quality overall, even when stopped down. This 10% drop in quality just shows how bad the plastic filter is and probably represents the worst case scenario. And if you stop down, image quality does not get worse – it actually gets a little better. That’s because beams of light enter the lens through different directions and very little actually shows up in the final image. If you were to put a lot of dust on the front element of the lens, you will be surprised that the image will look OK, just some decreased contrast. In fact, you have probably seen “DYI bokeh” articles on the Internet, which show that you can cut different shapes out of paper and attach them to the front of the lens. While less light will make it through the camera, you will still see the whole image, not just the cut out shape – that’s because light still enters the lens and spreads in all directions, even though the opening is 10+ times smaller. What truly does affect the performance of the lens is the rear element – that’s where things could get real bad. Make that rear element dirty or temporarily attach a small particle to it and you will see it in your image. Stop it down and you will see a really nasty blob! Check out this article on the affect of dust on bokeh – I wrote that a while ago. If I stopped down the lens to f/16, it would be almost similar to having dust on the sensor. Art, simple answer – protection and easier cleaning. For me, those two are worth adding a filter in front of the lens. Too bad that your 24mm PC-E got damaged so badly due to the filters. I often hear stories about filters saving lenses and this is the first time I hear a story that a filter made the damage worse. I guess that happens too! As for vignetting, yes, that’s absolutely true – you have to be careful about vignetting on ultra wide angle lenses. The 16-35mm vignettes even without a filter, so I would avoid using one. When I used a polarizing filter on this lens, I had to chop off the corners, because they were too dark to recover. So it certainly should go on a case by case basis. Surface may seem smooth to your eye, but in nanometer level it has “valleys and mountains” all over it. This roughness diffuses the light therefore your sharpness is reduced. Surface polishing is a relatively expensive and time consuming process.This also causes flares and ghosting. I assume this is the main reason why the cheap filters do worse. The glass itself may refract the light differently depending on the angle it passes the filter. This is called “Birefringence”. Normally, these kinds of materials are more expensive then regular glass. It is very unlikely to have these on any kind of filter. However if filter glass is made of some sort of a polymer (i.e. plastic) they might have some level of bireringence which reduces the sharpness further. But this probably minor compared to the surface roughness. In conclusion technically anything that you put in front of your lens will reduce the sharpness. However, the amount will depend on how good is that thing made. With a good filter probably no one will notice any difference. After all we are judging by the image from the sensor which has limitations too. Serkan, awesome stuff, great to hear from an expert in physics! So…. the “myth” is actually NOT debunked. Everything you place in front of your lens will reduce performance in some way, more or less. I use B+W XS-Pro Clear MRC-Nano 007 filters on all my lenses. Heliopan makes excellent filters as well. Both feature a brass mounting ring. Most others are made of aluminum. On some lenses I even use a rear mounted filter. When necessary I would much rather clean a filter than the actual lens glass. Frank, those are great filters, no doubt! Thanks for sharing. Advantages of nano coated B&W filters include: they are more “slippery” than regular single or multi-coatings and much easier to clean, they resist fingerprints (ever touch your CPL while adjusting it with the hood mounted? ), and water and mist simply beads up and rolls off or is very easy to blot away. Marumi also have very high quality filters, but they are not available from B&H. Are you planning to test the new B&W XS-Pro Digital ND Vario 1-5 stop MRC nano filters just arrived at B&H? They are much more reasonable in price than Schneider and Heliopan variable ND filters. As for the ND Vario filter, I have not seen it yet, so would love to test it! I’ve been a big fan of B+W filters for many years. In addition to their excellent optical properties, the filter ring is machined brass which is far less prone to jammed threads than aluminum. I usually run a fine mechanical pencil lead around the filter threads whenever I get a new filter to add a bit of extra insurance. My own tests show no visible deterioration in images when using B+W filters. If anyone is worried about getting maximum resolution, processing software that re-writes pixels, (e.g. lens correction or chromatic aberration removal) has a very visible impact, especially on high performance lenses. Maybe a test topic for the future? I’ve never seen a filter that was obviously plastic. There are very cheap (1/5th BW price) glass filters. It might be a much more reasonable test to try one of those against the higher priced filters. It seems to me (with limited knowledge) that it is obvious that a plastic layer in there would mess things up. I’m only surprised that it only measured at 10 %. Most of the Gradual Neutral Density filters are made from resin when they are produced in the 4×6 (100x150mm) size. Its high-quality resin and as these are from manufacturers such as Lee Filters, or Singh-Ray it would not be inferior in any way. I am sure there are cheap, plastic filters out there but most of the common brands, Hoya, Tiffen, B&W, Kenko etc are all high-quality (lens-quality) glass. Oops, meant Graduated (not Gradual). Still early for me. Yes, I guess there are cheap, nasty plastic filters around. What interests me is the cut off between effectively zero % sharpness loss (as Nasim’s excellent work shows) and 1 or 2 or 3 %. Do you have a choice of only the highest quality glass with near zero loss or cheap and nasty at 10%. If this is like almost everything else you can buy there is a wider range of choices available. And if it is like everything else half of the money in the highest end is wasted because they aren’t better than other cheaper options. Comparing the best and the worst doesn’t help since it is also a universal (almost :) ) rule that there is always a really cheap and useless alternative for almost everything so I’d expect the worst to be a poor purchase. Interesting article. I think another question that needs to be asked is how much does a UV filter really protect the lens? If you were to hit front of the filter hard enough, it could shatter and send glass back into the front element. From what I understand, glass scratches glass pretty well. Plus, at the right angle, whatever you hit the filter on could go right through the filter and still impact the front element. I guess I see the value in paying money for a high quality filter in order to “protect” the lens. Using the lens hood seems like a much better (and cheaper) alternative. B&H suggests that there could be a problem putting the original hood that comes with a lens on the lens if a B&W UV or Clear filter is attached to the lens. They don’t say it IS a problem. It is just a warning that it could be a problem on some lens/hood combinations. Since you use Nikon lenses with B&W UV filters, could you tell us if the filter makes it difficult to attach the hood that comes with the Nikon lens? Also, do any of your filters (perhaps slim B&W’s or Wide B&W’s) make it impossible to put the Nikon lens cap on the lens when the filter is attached? Dan, I have never had any issues attaching lens hoods on my lenses, with or without filters. I think they mean to say attaching lens caps. If you use a standard B+W filter, lens caps are not an issue. However, if you choose any of the “slim” models of filters, then you will not be able to attach the lens cap. The slim filters are for super wide angle lenses (to prevent excessive vignetting), which is why there is no room on the front of the filter. So, it is not just the lens cap. I did not find this warning on the non-nano versions of the clear filter. You said you tried the nano version of either the clear or the UV filter and found no difference, but did not mention any problem with the hood attaching. Do you or anyone else know about this and is it a problem for any 77mm Nikon lenses? Thanks for your replies and a fantastic website. Thanks, Nasim. I appreciate the fast response. Your website is great. What filter do you use, if any, with your 500mm f/4? Antonio, I use the standard Nikon clear filter (slip-in) that comes with the 500mm f/4. I used to put on filter to all my lens, yes good quality filter not give any effect to the pic quality. I’m not against people contras with filter lens but for my experiences and personally filter lens help me in difficult situation taking photo eg. Landscape photo in dessert very fast build dust in the front of the lens, or mist in the area of water falls. When the camera fall/droped the impact will hit the filter first and it will reduce impact to the lens but this it will not give you guarantee your camera/lens will not have effect from that accident at least already less risk to the lens. Question, what impact do think leaving on a HOYA Super HMC PRO 1 under a circular polarizer? Mine is a B&W MRC nano XS pro. Im using the Fuji 55-200 lens. If there no appreciable difference it would be nice not have to remove the uv filter to use the polarizer. On an aside, but interesting topic. We recently purchased the Canon EF 15-35mm f2.8L. Absolutely fantastic lens, but realized (post purchase) that it was an 82mm filter size. I was very disappointed, then learned that Canon had also changed the filter size on the 24-70mm f2.8 as well…both 82mm. We, like many people, have invested heavily in 77mm filters and are quite disappointed that they would do this, especially on a lens which would be considered a stock lens, not a speciality lens. I sure hope that this is not the trend…Nikon, DO NOT do this please! Thanks once again for a very useful article. Was wondering – do you happen to have photos of the same thing shot from expensive filter + cheap filter? If not, is there any perceivable difference to the eye when viewed on screen or print? Thanks again for the great job you do on this website. Great Article, was looking for something like this.. I am trying to decide on a filter for my new Ultra Wide zoom = Canon EP-S 10-22mm. B&H recommends that I consider a slim filter to avoid vignetting issues. 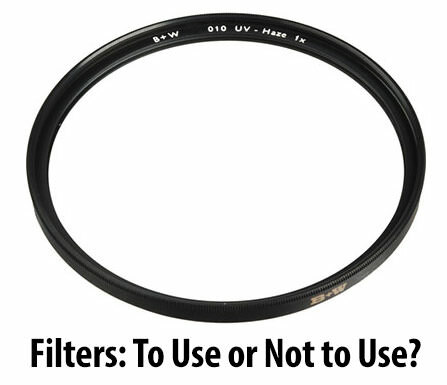 The 2 filters I am trying to decide between are the B+W 77mm UV Haze SLIM MRC 010M or the 77MM XS-PRO UV MRC-NANO (010M). I get the impression that the nano lens is also slim, but not sure whether slim enough to avoid vignetting on UWA lens. I like the idea of easy cleaning of the nano lens, and it appears it does have some threading so that the original lens cap could be used. The nano filter is also cheaper than the Slim MRC. Not sure whether either filter would allow me to use in conjunction with a lens hood. Your thoughts? I ordered a B+W 77mm UV Slim MRC 010 filter from an online vendor. When it arrived, I found the box was sealed only on the top side – the bottom side had no seal at all. Is it normal? window glass aside from the $5 variety no brand filters from Walmart. Do we need to remove the UV filter when using the graduated ND filters adaptor ring , to avoid any image dégradations ? Could you take a company taht has a full line from disgusting to excellent, and do a test on a good lens with each? In this case you used a cheap plastic filter on a meh lens, and got about a 10% degradation. That makes me think that the the difference between the top of the line and the #2 or #3 in a lineup will be minimal.